Liberal Scott Brison is pushing his favourite dictator once again--lvaro Uribe Vélez, president of the narco-state known as Colombia. 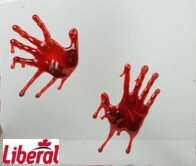 With Liberal support, the Harper Conservatives will obtain parliamentary approval for a free trade agreement with a country that practises genocide against its native population, accounts for 70% of all the murders of trade unionists in the world (with multinational corporate complicity), and has displaced literally millions of poor Colombians to make way for wealthy developers. That would be bad enough. But the revolting Brison has the face to take a swipe at the NDP, accusing it of purveying "mischief and misinformation" and calling it "hypocritical" for not being as vocal in its criticisms of the Venezuelan regime of Hugo Chvez. Were Chvez and his government to commit genocide, murder labour activists, turn millions of people into internal refugees and block judicial investigation into paramilitary atrocities, as Brison's hero Uribe has done, this would, of course, be more than likely to happen. But until then, it's a bone-stupid, false moral equivalence--an alibi, in fact, to cover the bloody tracks of the Liberals and their Conservative allies as they proceed to give cover to one of the most murderous and lawless regimes on the planet. And Blogger Alison at Creekside has already explained why. This page contains a single entry by Dr. Dawg published on April 21, 2010 5:53 PM. Rights and Democracy: the movie was the previous entry in this blog. Alain Pr?fontaine and conflict of interest is the next entry in this blog.